Seriously? OMG! WTF?Hallmark Archives - Seriously? OMG! WTF? When Calls the Heart might have parted ways with Lori Loughlin due to the college admission scandal, but Hallmark Channel has no plans in parting ways with the show. Erin Krakow announced today that the period drama was picked up for a seventh season that will begin airing next year. The show resumes with new episodes, without Loughlin, starting on May 5th with a two-night event. WCTH is one of the most-watched shows on cable TV. On March 17th, Hallmark Channel announced that it was parting ways with Lori Loughlin because of how she reportedly got both of her daughters into college…illegally. That meant that her series, When Calls the Heart, that was airing its 6th season, had to be retooled to eliminate her presence. The retooling is done and the show will begin airing new episodes starting on May 5th. Since the viewers have been so loyal to the show, they will air a second episode the next night as a present. Just to give you a hint how popular WCTH is, it was the second most-watched show on cable during its 6th premiere week It was only beat by The Walking Dead. It will be interesting to see how it does without its most famous, now infamous, star. On Thursday, Hallmark Channel announced that it was parting ways with Lori Loughlin, who was indicted for allegedly illegally bribing her daughters’ way into University of Southern California. That meant the end to her starring role in the Garage Sale Mystery movies, any of their other telemovies and the series When the Heart Calls. The latter is the biggest problem of them all for them. The drama just began airing its 6th season and is still a powerhouse for the network. What to do? Well, Hallmark pulled tonight’s episode, but what does that mean for the future of the series? Over the weekend, the producer Brian Bird gave an update on his show. “Hearties, Thank you for your love, support, and patience these last several days as we have all been preoccupied with the news about Lori Loughlin and her family, and the decisions our colleagues at the Hallmark Channel USA needed to make. As you can imagine, everyone involved with When Calls the Heart was surprised by these developments, so we hope you can forgive us for initially staying silent while we sorted through how to respond. “As for the show itself, we know millions of fans are on pins and needles wondering what will happen now. Let us reassure you, When Calls the Heart has always been bigger than the sum of its parts, and it HAS NOT BEEN CANCELED. With the full support of the network, we have gone on a creative hiatus to do some retooling on the remaining Season 6 episodes. That process has already begun. 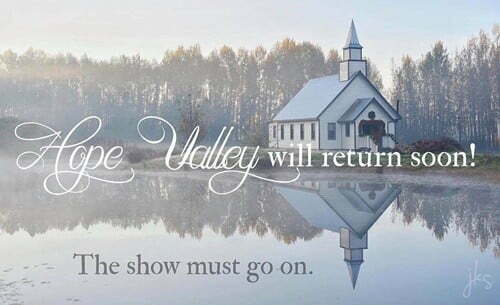 Hope Valley will return to your TV screens as soon as we can bring the episodes to you. I am happy that the network will keep the show alive for its fans. I just feel the cast and crew had to suffer unnecessarily because of someone’s costly mistake. Just days after Lori Loughlin was indicted and arrested for allegedly helping her daughters get into college illegally, Hallmark Channel has made a decision about her future with their networks. She was in Canada filming with the network when the news broke, now the 16th Garage Sales Mysteries telemovie looks to be in doubt. No word if Hallmark Channel will continue airing the series When the Heart Calls which is currently airing its 6th season on Sundays nights. The show averages around 2 million viewers. Is the news a surprise? Of course not. Hallmark Channel is a squeaky clean network and would not want to be associated with her and her scandal. Which makes you wonder if Netflix will do the same with her for the final season of Fuller House. If they can fire creator Jeff Franklin, then they can do the same with her. Which makes you want to ask her, was it worth it? UPDATE: It was not worth it because Hallmark Channel has pulled Sunday’s new episode of When the Heart Calls. Not only that TMZ is reporting that both of her daughters have dropped out of USC. They say that Olivia and Isabella could not handle bullying. UPDATE 1: Lori Loughlin will also not be returning for the final season of Fuller House on Netflix. Whose new eyebrows do you like better: Jerry O’Connell or Cameron Mathison? In the last week, Jerry O’Connell and Cameron Mathison got a new look over their eyes. The Stand By Me star sat down with a threader who threaded his bushy brows thin. Kind of like what puberty did to him. When it comes to the Home & Family host, he had a little accident at home that almost cost him a whole eyebrow instead of half of one. Thus causing the makeup department on the Hallmark Channel show to have an accident when they saw him come in. BTW I feel for O’Connell because that had to hurt a lot. I hope there is video!